While humans use their ears mostly for hearing, other animals find additional uses for their ears -- and in some cases, bigger is better. 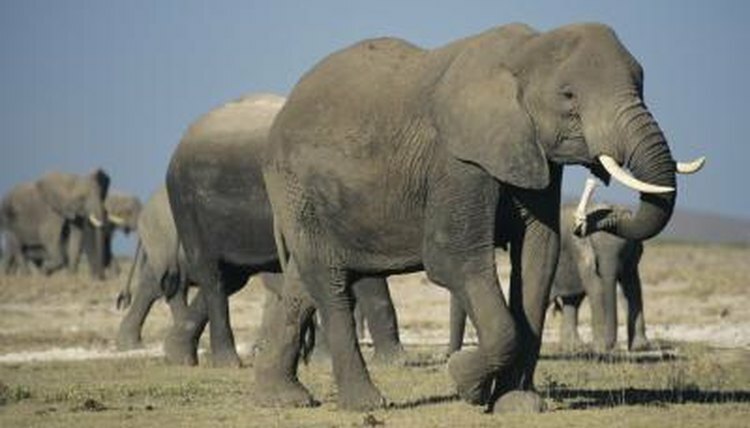 The African elephant has the largest ears of any animal on the planet. Those big ears let him hear what's going on in his environment, but he also uses them for other purposes. They're particularly useful for beating the heat, allowing these animals to live more comfortably in their African home. An African elephant sports distinctly large ears. His ears are so big that they can be about 1/6 the size of his body. The elephant has complete control over his ears, which are shaped like enormous flaps, and he can move them at will. Despite their size, though, the skin of the elephant's ears is particularly thin -- as little as 1/25 of an inch. Elephants have relatively good hearing, as they use their large ears to funnel sound into the ear canal -- kind of like the old-fashioned ear trumpets that humans used before modern hearing aids. Although elephants can't detect sounds in as high a range as humans, they hear lower sounds than we do, which helps them communicate over long distances. In fact, elephants can hear each other from distances up to 5 miles away. The thinness of the elephant's ears allows the animal to cool himself off in the African heat. The ear is full of blood vessels, and because they are so close to the surface of the skin, they radiate heat. Essentially, warm blood travels to the ears, and as it circulates there, it cools off before circulating back into the elephant's body. When an elephant's ears are wet, heat radiates away from the body even more effectively, which explains their love of bathtime. Because the ears are so effective at eliminating body heat, not all elephants need such big ones. In a cool environment, large ears could eliminate too much body heat. For example, the African elephant has the biggest ears in the world because he lives near the equator, where it's particularly hot. But the woolly mammoth had small ears because he needed to retain as much body heat as possible in his arctic habitat. Where Are a Bearded Dragon's Ears? Why Can Some Animals Hear Noises That Others Cannot?